Your Wedding Ceremony will always be the first moments of your marriage – how do you want it to feel? Whether your ceremony will be held as an intimate gathering in a casual setting, in a formal venue with many guests or is a surprise to your guests, your ceremony should be just that, your ceremony! The ceremony is something couples tend to consider towards the end of their wedding planning .Yet it is the one aspect of your wedding day that can be uniquely yours – there are so many options! Why settle for a cookie-cutter ceremony, where the couple’s names are simply inserted into a pre-set script? When your ceremony is meaningful, it will be memorable for you and your guests, for years to come. It can set the perfect ambiance to cascade into your special day! Before you sit down with any sort of checklist or “how-to” plan you find on the internet, the two of you should simply sit together and have a relaxed chat about your big day and your ceremony. Maybe as you sip a glass of wine, imagine the moment when you become married! Before you can make any decisions about your ceremony, you really need a shared vision of what will make it perfect for the two of you. It’s funny, couples often jump into the big aspects of wedding planning without giving their ceremony much thought. Ask yourselves … what do we want? Take some time to see how you each picture your ceremony unfolding – brainstorm ideas from the serious, to the fun to the fantastic! You may need to chat a few times; there are no wrong ideas or answers to the questions you will consider. It’s simply a matter of finding out what is important to the two of you for your ceremony. Your answers will help you decide what is most important to you, for your ceremony. Have you attended other weddings and really liked an aspect of the ceremony or have you seen something you absolutely don’t want within your ceremony? How do we want our ceremony to make us feel? Do we want to include or honour family and friends within our ceremony? Do we want to write our own vows? Will we each write our own vows, or both recite the same vows? How much say do we want to have in our ceremony content? Do we want a straightforward ceremony, a personalized ceremony or fully custom ceremony? Do we have a theme for our wedding that we want to have reflected within the ceremony? Do we want to include religion or religious elements? Do we prefer a non-religious ceremony? Does anyone have expectations for our ceremony (e.g. family) that we might want to consider? How much of a priority is our ceremony within our budget? Jot down your answers and make note of any ideas or questions that pop-up during your discussion .Be sure to note things you aren’t sure about – these are good questions to ask. You only need to decide what you want to do – your Officiant will help you decide how to weave your preferences into your ceremony. It can be helpful to know what you want for your ceremony, before you begin to interview Officiants. How else can you decide if an Officiant is a best-fit for you? Consider what is special to the two of you as a couple–what are your hobbies, how did you meet, what do you enjoy together? The answers may give you some wonderful ideas for your ceremony. 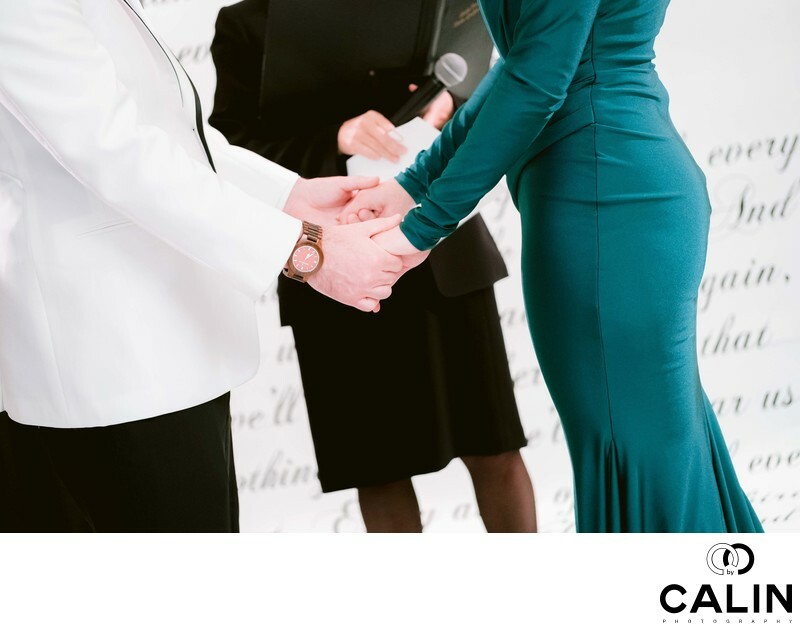 When you chat with an officiant, mention your interests such as… we both really like sports, foods, wine or we have an amazing love story… Be sure to ask: how can we incorporate ‘us’ into the ceremony to make it ours? When you look to your future, what aspects of your individual lives will you blend to become traditions or celebrations that you will share together? These may be family traditions, cultural or religious traditions or you may be welcoming children into your marriage. Touching on these within your ceremony can highlight your intentions for your future together. Contemporary touches to old traditions: Some classic ceremony traditions can take on a contemporary spin to meet your vision. How will you approach “walking down the aisle” – there are many options to make this ritual contemporary, with a good fit to your values. For example, you might choose to walk in as a couple symbolizing your entry to your marriage, or you could each walk in with your parents being symbolic of stepping forward into marriage. Choices for flowers can be very meaningful and include a symbolic touch of recognition of family members who are unable to attend. A wedding ceremony can be a beautiful time to acknowledge the influence of special people in your lives and their part in helping you become the individuals who are entering into marriage. Planning for seating or entry of these individuals in advance of the ceremony can be a tribute. Words or actions can be woven into the ceremony to share your appreciation. When a simple act of this kind is included in the ceremony, it doesn’t take much time but it does leave a memorable impression. You will need two witnesses and they don’t have to be in your wedding party! Although it is traditional to have the best men or maids of honour be the witnesses, this is not a legal requirement. Do you have family members or good friends you would like to have this honour? It can be a beautiful aspect of the ceremony when a grandparent, favourite aunt or uncle, or children of the couple are the legal witnesses to their ceremony. Do you have family who are unable to attend or loved ones no longer here, who you would like to honour within your ceremony? This can be woven delicately into the ceremony with words or quietly with actions that you find comforting. Including readings in your ceremony can be a beautiful way to share your feelings. They can be poetry, excerpts from a special novel, quotes from a favourite speaker or sometimes couples choose to share lyrics from a favourite song. When lyrics are spoken, they can be lovely! Choosing speakers for your readings can add a nice touch. It is a nice way to involve individuals who are special to you, within your ceremony. Possibly choose someone who may not want to write and deliver a speech at your reception, but who will be more comfortable knowing that you have chosen something for them to read during the ceremony. Meaningful rituals bring an energy to your ceremony! Think of the emotion that arises with the most familiar ritual in a ceremony – the exchange of the rings. Rituals are a way to add a personalized touch to your ceremony that is meaningful to you or your loved ones. You can add a ritual that is romantic, fun or deeply sentimental. It can be subtle and occur ‘in the background’ or be shared with your guests. Through rituals you will celebrate the joy with which you become married and the love you share with others. Maybe take a fresh spin on a traditional ritual such as a candle lighting, hand-fasting or a ring warming. It is the words and actions that accompany the ritual, that will make it uniquely yours. A unique ritual that symbolizes what is important to the two of you could become a tradition that you will enjoy repeating on anniversaries in years to come! It is never too early to think about your vows! Your vows are the promises you make to each other about your future together. They can be the most personal part of your ceremony. Will you each say the same vows? Will you write individual vows to recite as a surprise on your wedding day? 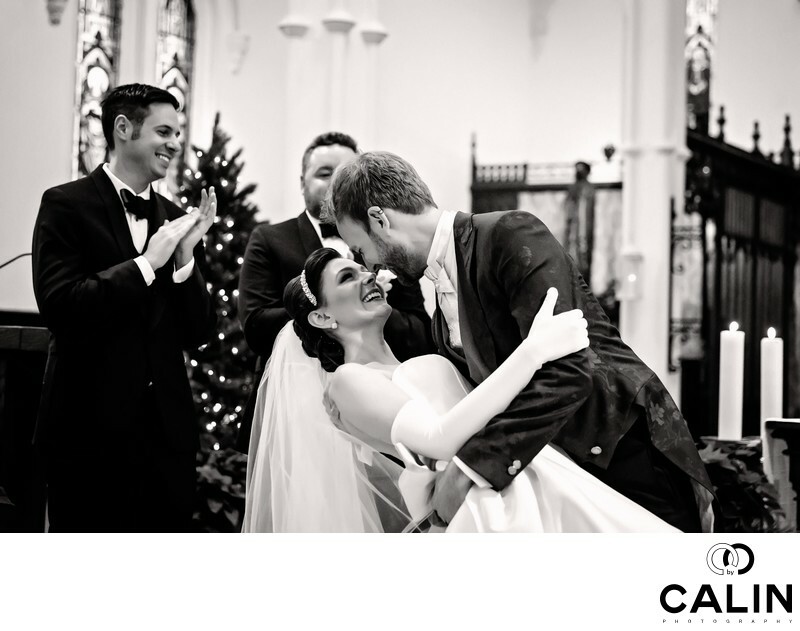 An emerging trend is for each partner to recite a declaration of love and then recite the same vows! Suggestion: do not memorize your vows, it is too much pressure for your busy day! Prepare them double spaced and in a large font, so they are easy to read on-screen or from paper, if you get misty eyed. In Ontario, it is highly likely a religious Officiant will marry you - there are almost 23,000 Registered Religious Officials who can perform marriages. To be a Registered Officiant in Ontario, individuals must be ordained within a denomination. You want to be aware of any denominational requirements an officiant must adhere to, for your ceremony. A civil marriage may be performed by an Ontario judge, Justice of the Peace or a Municipal Clerk/Delegate designated by a township to perform marriages. Check your local municipal office to see if these types of officiants are available in your area. Note that some City Hall locations do not use the services of civil officiants, they work with Registered Officiants. Ensure that the Officiant you choose will be responsive and respectful of your religious beliefs whatever they may be, for the ceremony. For your ceremony to be meaningful to you as a couple, it is important that your beliefs are respected, whether you align to a recognized religion (or religions), are spiritual in nature, agnostic or you are atheist. Specialists in Ceremony Design: Life Cycle Celebrants® are relatively new to Ontario and many are also Registered Officiants. There are just over 30 who have completed the extensive training in wedding ceremony design . They are educated in a wide breadth of world ritual, ceremony and tradition choices and have the skills to ensure that your ceremony is heartfelt and meaningful. To perform weddings in Ontario, Life-Cycle Celebrants® are ordained within religious denominations. Once you decide on your date and wedding venue, you should book your officiant! Couples who make choosing their officiant a last-minute decision, really are at a disadvantage. As you get closer to your wedding date, the more likely you are to face decision fatigue about your special day. Your budget is likely getting stretched and skewed from your original priorities .You may discover that you have spent more on your wedding photographer, wedding cake or guest favours, than you have available for your wedding ceremony! If the ceremony is a special aspect of your big day, plan ahead so you can choose from a wide range of Officiants. Your ceremony is an intensely intimate time for the two of you and your Officiant is closely involved in the special moments you share. It is very important that you feel a sense of connection with your Officiant and are confident that they will provide the ceremony that you envision. Interview an Officiant to get to know them! As a first step, confirm an Officiant’s availability for your date, time and location; then request a time to chat about your preferences and the services they provide. Keep your ceremony priorities in mind during the discussion. You want to find the Officiant who is responsive to how you picture your ceremony – so it is your ceremony! It is also important for you to know how an Officiant will interact with you as a couple.If you’re really confused about what you want for your ceremony and don’t know where to start, admit this when performing the interview. It will give you a sense of how they will be helpful and how they might guide you as a couple as you plan your ceremony. Tell us about… your experience performing weddings – do you have any favourite ceremonies? How do you… interact with couples?How will we collaborate to plan for the ceremony? Are you comfortable… performing a ceremony that is: inter-faith, includes certain rituals or is themed in a certain way, or … (be sure to specify whatever may be special to you)? Will you perform… the ceremony to our religious preferences? Be explicit if you prefer a secular (non-religious) ceremony. How do you decide… on the ceremony content? How will we know it meets our preferences? Have you had… any awkward ceremony experiences and how did you respond? What is.. your back-up plan if you cannot make it to the ceremony? How will you coordinate with…individuals involved in the ceremony? E.g. photographers, videographers, musicians, speakers etc. What are… your fee levels? What services do you include? Can we see a sample of your contract? Compare the answers you get from the officiants you interview. Some officiants will ask questions to understand your priorities and will be responsive to your interests. Others will share how they will marry you, letting you know their preferred approach for marrying couples. As a couple you should get a sense of who will be the best-fit Officiant, to pronounce you married! 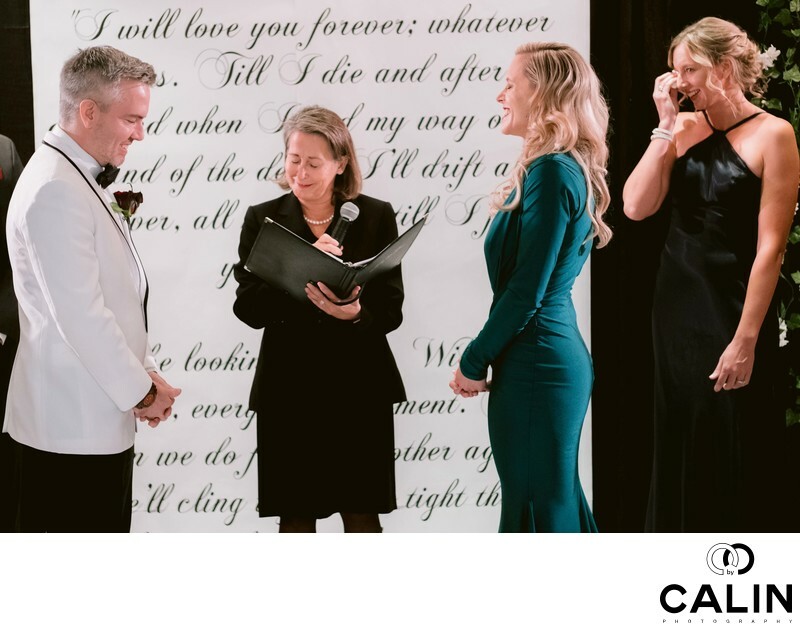 One of the most common questions the couples have is How Much Does an Officiant Cost… Officiants offer very different service levels and it is important for couples to understand that there isn’t just “one ceremony” that is performed at different price levels. There is quite a range in Officiant fees as there is quite a range in the available skills and talents of Officiants. The question how much does an officiant cost? Is a tough one to answer. It is close to asking how much does a wedding dress cost? Or how much will the reception cost? There are so many variables. Officiant fees are generally based on one of two perspectives. The services an officiant provides in response to what a couple wants for their ceremony, or the set of services an officiant will provide based on a service package that is similar for each couple they serve. You truly need to know what you want for your ceremony, to be able to decide what is a fair fee. Be sure that the officiant you choose has the skills and professionalism to create and provide the ceremony that you envision. It is important that you get what you want for your ceremony. Your ceremony can be the most magical and memorable part of your wedding day! Invest the time to understand what will make your ceremony special to you and be sure to find an officiant who will provide a meaningful and joyful ceremony experience.Years from your special day, you want to be able to reminisce with smiles when you ask, do you remember when we said “I-Do”?